The DotNetNuke 7.0 Developer Quick Start page is intended to be used as a resource that can help get DotNetNuke extension developers up to speed on the latest offerings available in 7.0.0. An overview of the new features can be found here . 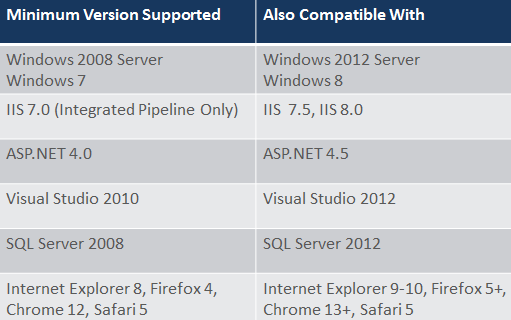 With the 7.0 release, DotNetNuke has changed pre-requisites for installation/upgrade. These are required for a number of reasons, but primarily so we can utilise the Web API from Microsoft and leverage some additional new capabilities of .net 4.0. Shaun Walker details the reasons for these changes here. Services Framework is built on top of ASP.Net WebAPI. There are only a couple of small things that must be done a bit different in Services Framework than in ASP.Net WebAPI. In almost all cases when the question "How do I do X with Services Framework?" comes up, the answer is "The same way you do it in ASP.Net WebAPI.". Note: the wiki has another has an additional Services Framework - WebAPI page with useful information and links. Not much and everything. In DotNetNuke 7 Services Framework has made the jump from ASP.Net MVC to ASP.Net WebAPI. The core features or mostly the same, but the under pinnings are totally different and better. By default in ASP.Net WebAPI everything can be called by everyone with various attributes are then applied to tighten security. Services Framework takes the opposite approach, by default everything requires Host level access. Attributes are then applied to loosen those restrictions. All Services Framework controllers must inherit from DnnApiController. DnnApiController takes care of authentication and loading DotNetNuke context. Remember that by ASP.Net WebAPI convention controller names must end with "Controller" (e.g. MyFirstController). Very similar to the ASP.Net WebAPI AuthorizeAttribute, but with an extra propertie and it works with DotNetNuke users. In ASP.Net WebAPI routes are normally mapped at Application_Start in Global.asax. In ServicesFramework routes get mapped after DotNetNuke is initialized, and after new portals are created. To allow proper mapping of routes, each Services Framework module must implement one instance of IServiceRouteMapper. Do not implement more than one instance of IServiceRouteMapper in a module. Doing so will cause the order of your routes to be undertermined. The RegisterRoutes call is also a good time to make any changes to the GlobalConfiguration of the WebAPI, as it is guaranteed to be called before processing and service requests. Modifying GlobalConfiguration will affect all services and should only be used with great caution. It is also important to remember that RegisterRoutes may occaisionally be called more than one time during the life of an HttpApplication. Routes must be registered each time RegisterRoutes is called, but any other initialization likelly should only occur during the first call. string moduleFolderName This is typically the name of the folder in which the module is installed. This will be used as part of the route name that is required by ASP.Net WebAPI. string url The url for your route. This exactly the same as the ASP.Net WebAPI routeTemplate parameter. string namespaces An array of namespaces to search for controller to match this route. object defaults This is exactly the same as the ASP.Net WebAPI parameter. object constraints This is exactly the same as the ASP.Net WebAPI parameter. Provides a GetName method that allows you to get the true name of each route mapped by the route mapper. Provides a DnnLink method to be used in place of the standard Link method. DnnLink takes some extra paratmers that are used to generate a link for the correct DNN route and portal. RequiresHostAttribute Apply this attribute to true to require Host level access. WebAPI provides a standard and complimentary AllowAnonymousAttribute which also works with Services Framework. Additional MediaTypes Services framework adds a media type formatter which can convert between text/plain or text/html and string types. This is useful for AJAX services that are meant to return plain text. Authentication methods Services Framework adds built-in authentication in three forms. Web forms is useful for developing AJAX based modules. It requires that users login via a standard web page. It is recommended to be used with SSL otherwise the user credentials and Auth cookie will be transmitted in the open. Basic Auth is useful for providing credentials outside of AJAX situations. User credentials are transmitted as Base64 encoded text, so SSL is highly recommended. To prevent browser interception, the WWW-Authenticate header is omitted from responses to XMLHttpRequests however the Basic Auth mechanism will work if credentials are provided in the headers, though it is not clear that this provides any advantages over Web Forms authentication. Digest Auth is useful for providing credentials outside of AJAX situations. User credentials are encrypted along with a nonce to help protect the credentials. Digest Auth may be a good choice where SSL is not available. To prevent browser interception, the WWW-Authenticate header is omitted from responses to XMLHttpRequests therefore it is not possible to use Digest Authentication in an AJAX context. namespaces Services Framework requires all routes specify one or more namespaces in which to locate applicable controllers. DnnModuleAuthorizeAttribute This attribute is used to secure a service based on the permissions of a module instance. When using this permission all clients must submit the relevant Tab and Module ids as headers, there are helper methods in the JQuery plugin to help with this. The attribute has properties for PermissionKey, and AccessLevel each request will call ModulePermissionController.HasModuleAccess with the specified properties to authorize the user. SupportedModulesAttribute Normally used in concert with DnnModuleAuthorize, this attribute takes a comma delimited string of module names, and only allows access to modules whose registered name appears in the list. ValidateAntiForgeryTokenAttribute This attribute is similar to it's MVC equivalent, and in fact uses the same .Net base classes under the covers. It is intended to help prevent CSRF style attacks on web pages. It works by placing an encoded cookie and form field into a web page. Each request must include a matching set of these values. To make the anti-forgery device more friendly to content types other than form-urlencoded (e.g. JSON) the form fields are submitted as headers. There are helpers in the JQUery plugin to assist with submitting the correct values. JQuery Plugin_ To assist in using the Services Framework for AJAX module development a JQuery plugin has been included. It is quite small and well worth reading through the debug version at /js/debug/dnn.servicesframework.js. The plugin includes a few more methods than what is listed below, but they are primarily intended as helpers for the below methods. getServiceRoot Pass in the moduleFolderName of your service and it will return the correct root path to call your service for the current portal. The general form is /childpath/DesktopModules/moduleFolderName/API/. setModuleHeaders This is meant to be called as a beforeSend method $.ajax. It will set headers for tab and module ids as well as the anti-forger token if present. Provides additional methods to get the Tab and Module Ids included in a request. The tab and module id formats can be extended beyond the default header and query string locations by implementing the ITabAndModuleInfoProvider interface. Also provides safe access to the HttpContext of a request. Wherever possible HttpContext should be avoided in services, however it is not always possible in those rare cases this method should be used. This method is essential when writing an Asynchronous service as the HttpContext will not be available from HttpContextSource.Current, or HttpContext.Current. There is also a GetIPAddress method available to cover the single most common reason for accessing the HttpContext. By default tab and module information can be passed to service framework requests via headers or the querystring. It is possible to extend these options by implementing the ITabAndModuleInfoProvider interface. Once a new implementation is written it must be registered via the HttpConfigurationExtensions.AddTabAndModuleInfoProvider method. This should be done inside a services route mapper, and care should be taken to only register the provider the fist time routes are mapped. It is occaisionally possibe for routes to be remapped while the site is up and running, which results in additional calls to map routes. Services Framework ships with some general purpose authentication filters and attributes. However it may be necessary to implement authentication and authorization specific to a service. It is quite straight forward to implement your own filters and attributes they should be derived from one of AuthFilterBase, or AuthorizeAttributeBase. Additionally there is the IOverrideDefaultAuthLevel interface, this interface is used to indicate that the presence of the auth filter should override the default Host only authorization required to access a method. This is used on many auth filters but not all, a good example of a filter that doesn't need this interface is the ValidateAntiForgeryToken. Passing the anti-forgery check says nothing about the level of authorization required to access a method. Due to breaking changes explained above, modules which utilized the services framework in 6.2.x versions will need to be updated for 7.0 in order to operate. It is also worth noting that any module that utilizes notifications with custom API's call will also need to be updated. - Social Groups can now be renamed. - System Roles(Administrators, Registered Users, Subscribers, Unverified Users) are marked as IsSystemRole in the database and thus cannot be renamed. - Security Roles can now have multiple owners. This blog covers this in more detail, and the wiki has a useful page here that explains more on the how default.css works. Further details can be found on the DAL 2 page.